Autoimmunity is the inability of an organism in recognizing its own parts as self, which triggers an abnormal immune response against its own cells or tissues. Due to such a response, autoimmune diseases occur. Systemic autoimmune diseases: The symptoms and damage occurs throughout the body, i.e the antigen is not tissue-specific. Localized autoimmune diseases: The damage is localized, i.e., the antigen is tissue specific. Rheumatoid arthritis (RA) is a chronic inflammatory, systemic autoimmune disorderthat may affect many tissues and organs, but mainly attacks the flexible (synovial) joints. 75% of the reported cases of RA occur in women, especially at age: 30 and 40 years and between 50 and 60 years (Bach, 1982). It can be a disabling and painful condition, which can lead to consequential loss of mobility and function if not treated adequately. But it is still unclear whether T-cells primarily respond to a microbial antigen, or a self-constituent antigen (Chiniet al., 2002). Lesions developed in RA appear to be involved in both cell-mediated and humoral responses. Prior research work focused on identifying the cells present in the affected synovium, and has been concluded that CD4+ T lymphocytes, active B lymphocytes, and plasma cells, combined with well-formed lymphoid follicles having germinal centers (in more serious cases), are present in the synovium of the patients (Abbas et al., 1994). Major cells present in the synovial filtrate of patients are T-cells, and a partial therapeutic effect was observed due to depletion of T-cells in these patients (Berneret al., 2000). Present understanding of RA conveys that TH1 cells which are specific for a particular antigen (which hasn’t been identified yet) are present in the joints of the patients. Fig1.1: Release of cytokines due to T-cell activation causing an inflamed synovium and pannus. Cytokines released in the synovium are Interleukin(IL)-1, IL-8, Interferon-gamma (INF-gamma), and Tumour Necrosis Factor-alpha(TNF-alpha). But the clinically important ones are IL-1 and TNF-alpha. These cytokines stimulate increase in collaginases, IL-6, chemokines, nitric oxide and Cyclo-oxigenase-2(COX-2) production. The combined action of these and a few others like IL-2 and IL-4 lead to the pathogenesis of the disease. 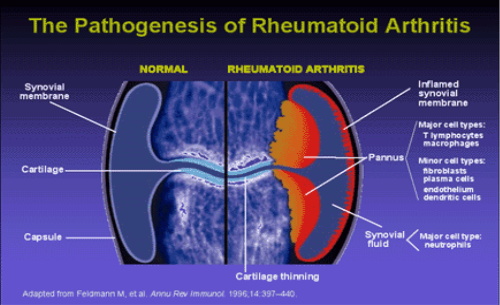 Other than antigens, RA also involves antibodies- this is most likely due to formation of immune complexes. The auto-antibodies produced are called ‘rheumatoid factors’ and are specific to the Fc region of IgG. This rheumatoid factor is an IgM antibody and hence the immune complex consists of IgG-IgM which cause the damage (Janeway et al., 2001). Symptoms include stiffness, pain, swelling, and erythema, joints become tender, swollen, and warm. As it progresses, multiple joints would be affected (polyarthritis). The clinical manifestations are collection of polymorphonuclear leukocytes and macrophages at the inflamed region, cartilage damage, and, destruction of the joint Synovitis (inflammation of the synovium) can lead to tethering of tissue, lack of movement and erosion of the surface leading to deformity and loss of function. Systemic complexities are damage to various other organs like lungs, myocardia, pericardia pleura, eyes, and Central Nervous System as a result of inflammatory reactions (fig-1.1). The focus of this paper is to state the latest therapeutic monoclonal antibodies being used for RA treatment, to state their merits and demerits and whether they are better than normal drugs/medication. Monoclonal antibodies with different mechanisms of action and route of administration are discussed and whether they pose as good therapeutic agents with an acceptable safety profile. Earlier it was believed that if one cytokine signal cascade was blocked then another cytokine would takeover. It was hypothesized that IL-1 caused the cartilage and bone damage.Through a study(at Kennedy Institute of Rheumatology), it was found that IL-1 bioactivity had stopped due to TNF-alpha blocking. This led to the development of anti-TNF-alpha treatments like- cyotokine antibodies and soluble-receptor antagonists (Feldmann et al., 1999). There are mainly four types of medications being used- Disease-modifying anti-rheumatic drugs (DMARDs), Non-steroidal anti-inflammatory drugs (NSAIDs), immuno-suppressants, and corticosteroids (glucocorticoids). (Rang et al.,1995). DMARDs include pencillamines (Cuprimine®, Depen®), gold compounds (Myochrysine®, Ridaura®) and chloroquine (Plaquenil®). Although their mechanism of action is not properly understood, they have a very significant effect on RA patients. NSAIDs like asprin, ibuprofen (Advil ®), ketoprofen (Orudis®), naproxen (Naprosyn®), etc.. have a variety of effects like anti-inflammatory, anti-pyretic, and analgesic effects.Immuno-suppressants like cyclosporine and cytotoxic agents like azathioprine suppress both humoral and cell-mediated immunity. Corticosteroids like prednisone, hydrocortisone, etc., have immunosuppressive and anti-inflammatory effects (Rang et al.,1995). Each B-cell synthesizes only one kind of antibody and every organism has various populations of B-cells which secrete various antibodies specific to various antigens being recognized. But in order to turn this function into a helpful tool, we need huge amounts of a same antibody. So we need to culture a B-cell population originating from the same ancestral B-cell and hence obtaining the same kind of antibodies.Such a population of cells are called ‘monoclonal’ and the antibodies are‘monoclonal antibodies’(mAbs).Such monoclonal antibodies used for various therapeutic purposes are referred to as ‘therapeutic monoclonal antibodies’. If a specific antibody of a B-lymphocyte is needed, that B-cell should be secreted in an organism. So the antigen for which the antibody is needed is injected into a mouse and it secretes the B-cell antibodies against the antigen. Such B-cells are isolated from the spleen and fused with myeloma cells (using Poly Ethylene glycol, or electroporation), forming hybridomas. To selectively isolate the hybridoma cells, they are grown in HAT(Hypoxanthine AminopterinThyamidine) medium. (Fig 2.1.1) The cancer cells are HGPRT- and the B-cells are HGPRT+(HGPRT is an enzyme Hypoxanthine-guanine phosphoribosyltransferase which helps in the synthesis of nucleotides from hypoxanthine). Therefore, all the unfused myeloma cells die in the HAT medium and all the unfused B-cells can’t divide for long and only the hybridoma cells survive indefinitely. It is from these cells that the antigen-specific antibodies are labelled and isolated using radioactivity or immunofluorescence. 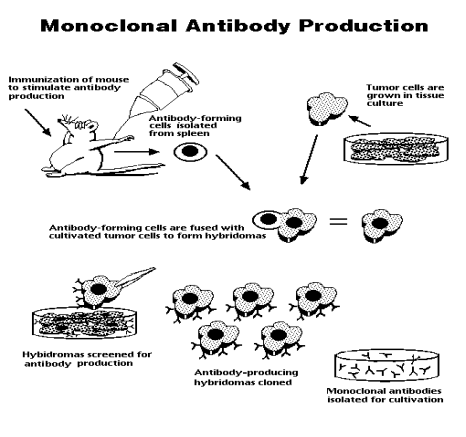 Fig 2.1.1- A summary of the process of monoclonal antibody production. Murine antibodies (suffix –omab)refer tomAbs made from any mammal of the family muridae (like mouse, rat). These mAbs were produced using hybridoma technology and were analogous to murine antibodies. But these were not a success because immune complexes formed due to which they only had a short half-life in vivo and caused cytotoxicity resulting in allergies and anaphylactic shocks .Hence these were replaced by chimeric and humanizedmAbs.Chimeric mAbs (suffix –ximab) has variable regions of murine and constant region of humans fused together (they are 65% human). This decreases immunogenicity. Humanized antibodies (suffix –zumab) are made by grafting murine hyper-variable region onto the amino acid region of the human Abs (they are 85% human). However, these antibodies lacked the specificity of their parent murine mAbsso, affinity was increased by introducing mutations in the CDR (complementarity determining region). Phage display libraries or transgenic mice are use to produce human mAbs (suffix –umab). In this the murine genome is injected with the human immunoglobulin genes due to which it becomes transgenic. This mouse is injected with the desired antigen to yield the subsequent mAbs(Hudson PJ, Souriau C., 2003). This is a chimeric IgG1 mAb and has human constant region with murine variable regions. (Perdriger A., 2009). This is best used with methotextrate(MTX) and is available only in the intravenus form. In 2001, it was approved by the FDA in combination with MTX to treat moderate to severe RA. Effectiveness and improvement in the disease compared to placebo was shown in multiple, randomized trials(Elliott MJ, et al., 1993) ,( Lipsky PE, et al., 2000), (MainiRN, et al., 2004). It was proven to be effective in early stages of the disease (< 3 yrs) without previous MTX treatment. (St Clair EW, et al., 2004).Given that influximab is comprised of a significant proportion of murine protein it was anticipated that patients would develop antichimeric antibodies that could impair the efficacy and increase the risk of infusion reactions. The combination of infliximab and MTX results in a substantial reduction in antichimeric antibody and increased serum infliximab levels..
Adalimumab is a human recombinant IgG1 mAb that has no murine component and is produced by phage display technology. It was FDA/EMA approved in, or soon after, 2002 for the treatment of moderate-to-severe RA as monotherapy or in combination with disease-modifying antirheumatic drugs (DMARDs). It is available in the subcutaneous form at a dose of 40 mg every 2 weeks. Despite adalimumab being a fully human antibody, anti-adalimumab antibodies have been detected in a significant number of patients(Vincent FB, Morland EF, Murphy Ket al.2013). Adalimumab responses and long-term sustainability may be reduced by anti-adalimumab antibodies, but adalimumab generally has good sustainability similar to that of etanercept and generally better than infliximab. Golimumab is a fully human IgG1 anti-TNF-α antibody that was generated and affinity matured in an in vivo system. It is very similar in structure to infliximab without the mouse protein. It was approved by the FDA/EMA in or soon after 2009 for the treatment of moderate-to-severe RA in combination with MTX(Kremer J, et al,2010). Certolizumabpegol is a humanized Fab fragment (Fc free) fused to a 40-kd polyethylene glycol (PEG) moiety. It was FDA/EMA approved in 2009 for the treatment of moderate-to-severe RA as monotherapy or in combination with MTX. It is available in the subcutaneous form at a dose of 400 mg at 0, 2 and 4 weeks, then every 2 weeks or 400 mg every 4 weeks. B cells are critical to the pathogenesis of RA. Mature B cells may evolve into antibody producing plasma cells. Although the precise role of B-cell-producing autoantibodies in RA remains unclear, B cell and plasma cell infiltration into synovium has consistently been found.In addition to their role as precursors to antibody producing plasma cells, B cells may function as antigen-presenting cells and may also produce inflammatory cytokines and co-stimulatory molecules important for T-cell function. (TngYKO,et al., 2007). As rituximab is a B-cell-depleting agent, chimeric/IgG1 monoclonal antibody which binds to the CD20 cell surface marker found on several maturation stages of B lymphocytes. It gained FDA/EMA approval in 2006 for the treatment of moderate-to-severe RA in combination with MTX in patients with inadequate response to anti-TNF. Rituximab is given via the intravenous route at a dose of 1000 mg for two doses 2 weeks apart for each cycle. The first study evaluated rituximab in RA was reported by Edwardset al., 2004.Four treatment groups consisting of MTX monotherapy, rituximab monotherapy, rituximab plus cyclophosphamide and rituximab plus MTX were compared, and all rituximab groups had a better ACR20 response compared with MTX monotherapy, with a comparable safety profile. IL-6 is a cytokine produced by immunologically important cells that has an important role in T-cell activation and immunoglobulin secretion.It also stimulates synovial fibroblast differentiation and osteoclast activation.Dysregulation of IL-6 is also, in part, responsible for many of the generalized systemic effects of RA, including anemia of chronic disease as well as the acute phase reactants seen in this disease(Tanaka.Tet al. , 2010). Previously called MRA, tocilizumab is a humanized/IgG1 mAb directed against IL-6 receptor in its soluble and transmembrane form. It was approved by the FDA/EMA in early 2010, or slightly before, for the treatment of moderate-to-severe RA in patients with an inadequate response to DMARDs and/or anti-TNF. A subcutaneous form of tocilizumab is currently under study. It is also indicated in patients with anemia of chronic disease since it dramatically increases hemoglobin as a consequence of reduction in hepcidin – the protein that inhibits iron utilization in RA. Infections are the most common adverse event associated with the use of all biologics. Infection risks with anakinra and tocilizumab are probably similar to the TNF inhibitors, with rituximab perhaps having slightly less risk.Infection risk may be higher with the use of increased doses of infliximab and anakinra.Respiratory tract infections are most commonly reported. The risk of granulomatous infections, such as tuberculosis, is also increased in patients using monoclonal antibody TNF inhibitors. The use of TNF inhibitors in patients with RA has not been associated with an increased risk of solid cancers, with the exception of cutaneous malignancies.. Malignancies have been reported with anakinra, tocilizumab and rituximab, but the risk does not seem higher than predicted in RA patients. (Ding T et al., 2010)Longer-term follow-up is required to more clearly understand the risk of malignancies with these drugs. Symptoms of demyelinating neurologic dysfunction have been associated with TNF inhibitors. Resolution of these symptoms with drug withdrawal is common. TNF inhibitors should be withdrawn immediately if neurologic symptoms occur with use, and probably should be avoided in patients with pre-existing demylelinating symptoms(Ding T, Ledinghamet al., 2010). Just as monoclonal antibodies have various side effects the medication used for RA also have various complications– There have been many news reports about how pain-killing drugs known as COX-2 blockers increase heart attack and stroke risks. Additional studies suggested that older non- steroidal anti-inflammatory drugs (NSAIDs) like ibuprofen could also elevate heart risks.One of the culprits: methotrexate. It’s the most commonly prescribed disease-modifying anti-rheumatic drug, orDMARD, for rheumatoid arthritis. It’s also responsible for hair loss in about 1 to 3 percent of people. The hair loss happens because methotrexate is doing what it’s supposed to do – stop cells from growing, including cells causing inflammation and, unfortunately, hair follicles. Folic acid, which is commonly prescribed with methotrexate to mitigate some of its side effects, is a synthetic form of folate, a B-complex vitamin. It can help keep hair healthy, but it has not been found to promote hair growth.Generally as a drug-related side effect, the hair loss is not drastic and the hair does not fall out in patches. And it usually grows back once the patients stop taking the drug.So as of now, most of thesuccesful treatments for RA using monoclonal antibodies are in combination with methotrexate. Monoclonal antibodies with different mechanisms of action and route of administration are highly effective therapeutic agents in the treatment of RA with an acceptable safety profile. Choosing the appropriate treatment is a complex decision that is affected by clinical data, physician and patient preference, and payers. Almost undoubtedly, these types of agents will continue to be important agents in the rheumatologists’ armamentarium. How to use these agents more selectively, particularly regarding which agents are best for which patients, hopefully will be better established in the future with new biomarkers. Prediction as to what agent to use in the right patient at the right time is clearly a research priority. Monoclonal antibodies as new agents are expensive, and the cost/benefit analysis justifying their use is also critical to practitioners. . Many aspects regarding the efficacy and safety of the supposedly cheaper biologics need to be evaluated before they are available for widespread use, but their availability and the emergence of new agents in the future may substantially change the RA treatment landscape. Although current therapies can reduce the signs and symptoms of RA for many patients, the quest for a cure (or a more complete blockade of the structural damage) in RA is still ongoing and will need treatment approaches, which are not exclusively confined to blocking a particular cytokine, receptor, or auto-reactive B or T cell involved in disease progression. To this end exciting treatment alternatives and drug targets are on the horizon that may become available to patients in the future. "Rheumatoid Arthritis Treatment Methods." UKEssays.com. 11 2018. All Answers Ltd. 04 2019 <https://www.ukessays.com/essays/biology/rheumatoid-arthritis-treatment-methods-2273.php?vref=1>. "Rheumatoid Arthritis Treatment Methods." All Answers Ltd. ukessays.com, November 2018. Web. 23 April 2019. <https://www.ukessays.com/essays/biology/rheumatoid-arthritis-treatment-methods-2273.php?vref=1>. UKEssays. November 2018. Rheumatoid Arthritis Treatment Methods. [online]. Available from: https://www.ukessays.com/essays/biology/rheumatoid-arthritis-treatment-methods-2273.php?vref=1 [Accessed 23 April 2019]. UKEssays. Rheumatoid Arthritis Treatment Methods [Internet]. November 2018. [Accessed 23 April 2019]; Available from: https://www.ukessays.com/essays/biology/rheumatoid-arthritis-treatment-methods-2273.php?vref=1.